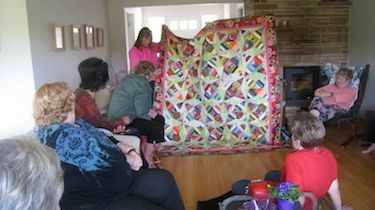 Show and tell session at the home of one of the members of the Quilters Anonymous group. 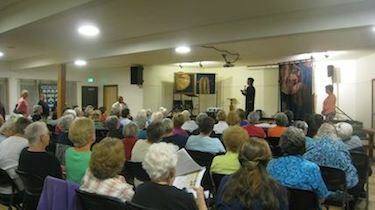 The quilt being shown has a brightness typical of Pacific Coast quilts. 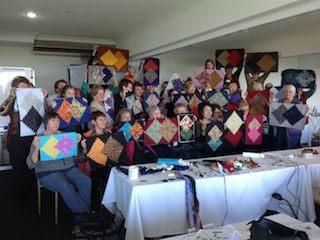 From the same session, a joyful quilt, made with emotion and verve. If one puts this quilt on a bed the room becomes cheerful, and all dreams will be pleasant. My first slide show in many years (presented twice on consecutive days) I was a bit nervous. 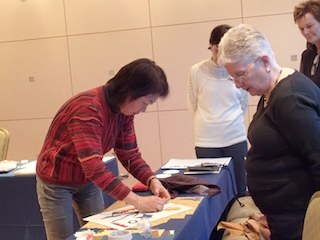 The subject was the sources for my quilt designs. Afterwards many people said "even if I see the same things that Emiko sees, she sees different objects. This lecture has changed the way I see things." The same presentation, but the following morning. 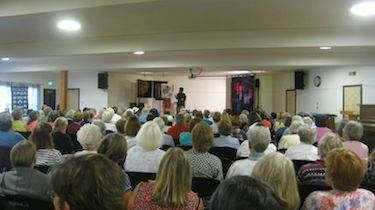 I was very happy that both were very well attended. 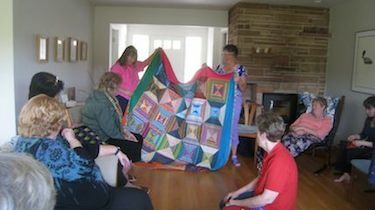 I told the story of "My American Family" quilt which I had made in 1993 for my mother-in-law's 80th birthday. Standard opening for my Log Cabin workshops, explaining the basic Log Cabin techniques. Later in the same workshop. 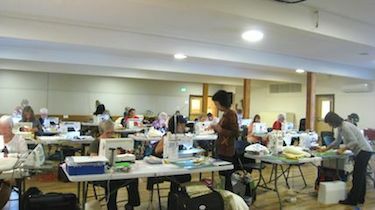 We had a large bright room with ample space for everything. 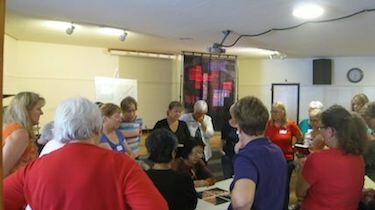 The members listened very carefully to my presentation of basic concepts. 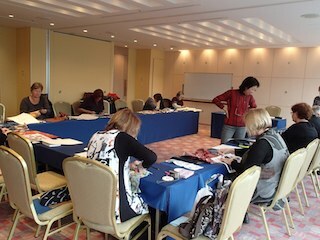 Everyone paid close attention to the difficult and important procedures for joining reversible blocks to one another. 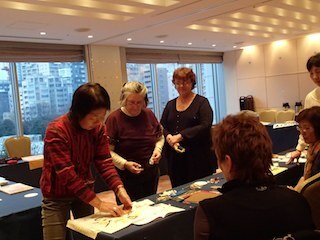 In a one-day workshop we can only make two blocks and join them together, but everyone enjoyed themselves thoroughly. 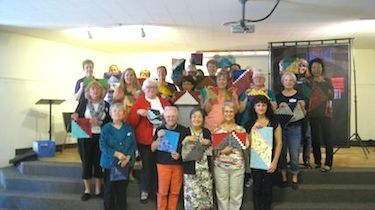 For the first time I conducted a workshop without sewing machines, for only two hours, using fabrics and 10 kinds of colored paper. I explained that the impression would vary according to the size and shape of the cut pieces of fabric. I explained my opinion concerning what I would do. I hope that everyone understood. 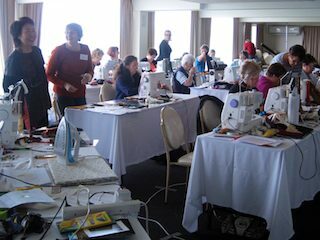 My first Australian teaching tour in seven years, with workshops on reversible Log Cabin quilts in Berry, Maleny, and Townsville. 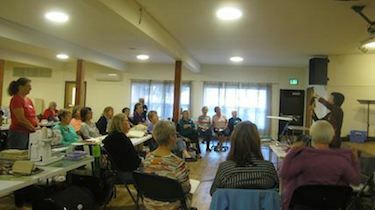 The class in Maleny, with thirty two students, including two who drove for two full days all the way from Melbourne. 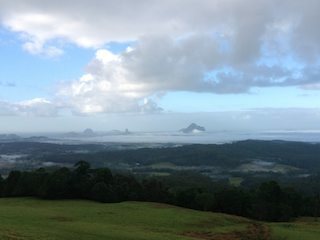 View from the hall where the Maleny workshop was held. The weather changed frequently, yielding an endless variety of colors. Quite a distraction. 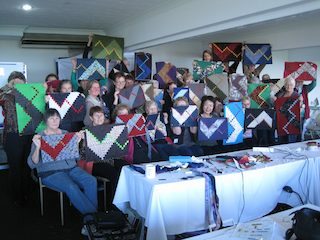 At the end of the 3 1/2 day workshop almost all of the students succeeded in finishing their mini-reversible quilts. 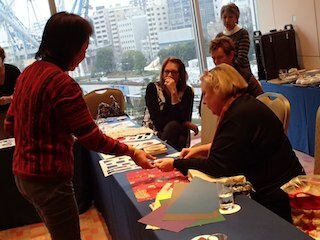 They each chose their own favorite colors, which created tremendous variety. The other sides of the same quilts. They seemed happy. I was very happy.